Mick Mulvaney, director of the Office of Management and Budget, will be acting White House chief of staff when John Kelly leaves at the end of the year. President Trump said Friday evening that Mick Mulvaney, his director of the Office of Management and Budget, will be the acting White House chief of staff. It's unclear how long Mulvaney will serve in the role, succeeding outgoing chief of staff John Kelly. Trump announced on Dec. 8 that Kelly would leave at the end of the year. "There's no time limit. [Mulvaney's] the acting chief of staff, which means he's the chief of staff. He got picked because the president liked him. They get along," a senior administration official told reporters at the White House. When asked why Mulvaney was named as "acting" rather than the permanent chief of staff, the official responded, "Because that's what the president wants." Vice President Pence's chief of staff, Nick Ayers, had been the leading candidate to replace Kelly, but he pulled out of consideration. Former New Jersey Gov. Chris Christie also said in a statement Friday he wasn't interested in the job. Rep. Mark Meadows, R-N.C., was a possible candidate as well, but the White House said on Wednesday he was no longer in the running. Kelly was Trump's second chief of staff in just two years in a White House that has had extraordinarily high levels of turnover. Kelly, a retired Marine general who led the Department of Homeland Security before becoming chief of staff, succeeded former Republican National Committee Chairman Reince Priebus. Mulvaney has served multiple roles in the Trump administration. In addition to leading OMB, he also became the acting director of the Consumer Financial Protection Bureau. Mulvaney's replacement at the CFPB was confirmed last week. 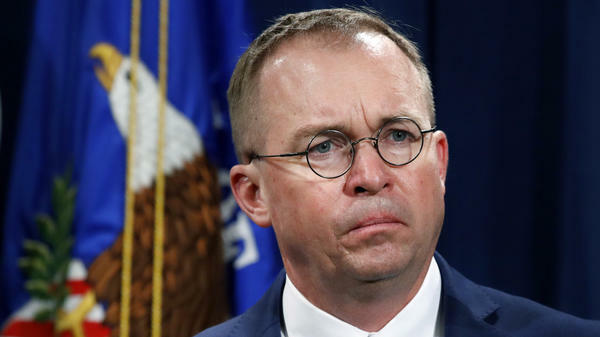 The White House clarified Friday night that Mulvaney will not resign from OMB. Spokeswoman Sarah Huckabee Sanders said in a statement that Mulvaney "will spend all of his time devoted to his role as the acting Chief Of Staff for the President." OMB Deputy Director Russell Vought will "handle day to day operations and run OMB." Mulvaney, a former Republican congressman from South Carolina, was part of the conservative House Freedom Caucus and was first elected in 2010 as part of the Tea Party movement. The administration official, who declined to speak on the record, said that Trump likes Mulvaney's experience on Capitol Hill and that he is "fiscally responsible." Mulvaney met with Trump earlier Friday at the White House, the official said, adding that Mulvaney didn't find out about the new position on Twitter. The official also said that Kelly was pleased with his successor. Shortly after Trump announced his promotion, Mulvaney responded, calling it a "tremendous honor."